It’s the first day of spring! Yet as I type this post on my laptop, in the reflection of the glass-framed picture on the wall in front of me I see a blur of falling, quickly accumulating snow. It doesn’t feel like spring in Philadelphia. But, before long, it will! 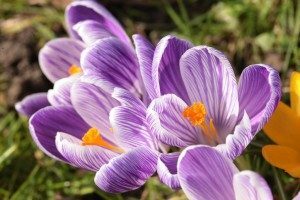 Springtime is perfect to organize areas in an around your house that are unpleasant to do when it’s too cold or too hot. I’m continually amazed when I’m contacted during the winter to help someone organize a garage. Caller: “I’m overwhelmed. My garage is a mess, I can’t find anything and can’t park my car in there.” Me: “Do you realize it’s 4 degrees?” Caller: A pause, followed by “Oh.” Me: “Maybe we should wait until spring.” Well, it’s spring! Then there’s the opposite. I worked with a husband and wife to organize most of their house. Along the way we stored things in the garage (which already was pretty full) for hauling away. Later, an appointment was made with a junk hauler. On the day the crew arrived, it was about 100 degrees in the garage. The client-husband decided today would be a good time to declutter the entire garage. After all, he reasoned, the junk guys were already there. So, for the next few hours we got rid of A LOT of stuff…and sweat! Wash windows inside and out (when it’s too hot, cleaning fluid dries quickly and can leave streaks). Clean the deck and furniture. Clean the car’s exterior including the undercarriage to remove road salt, declutter the interior and then give it a good cleaning. Switch clothes closets to spring/summer from fall/winter. Organize the garage (you knew it would be on the list!). Declutter the shed (outbuildings, like garages, tend to become dumping grounds). Ditto for the attic and basement if used for storage (there’s a very short period of time when it’s neither too cold or too hot). Walk around your house and note things like loose shutters or gutters, yard debris and/or gardening work to be done, then schedule tasks accordingly. Get the kids involved and make it fun for the family. Developing good organizing habits, especially at a young age, teaches skills that, among other things, prevent accumulation of Too Much Stuff. Learning these critical life skills can be learned at any age. My oldest client, so far, was 88! Spring is a time of renewal. My clients often express feelings of renewal and lightness after getting organized. If you’d like to experience this yourself, follow these tips, schedule time to do the work yourself or to hire help, and then it’ll be done before summer’s heat and humidity make these jobs harder. Utility cabinets keep things organized and out of sight. What I really like is that they provide boundaries—you only can fit so many things. If a cabinet is full and you need to add something, a similar size item must go. 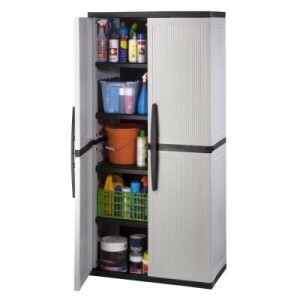 This unit has four adjustable shelves with five sections for storage. The heavy-duty plastic is durable and lockable for safety. Assembly required. It’s available from Home Depot for $129.00. For more information, click here.